"Vladimir Ivanoff walks into a department store to buy blue jeans, walks out with a girl friend, an immigration lawyer and a buddy. His life and theirs will never be the same again." Robin Williams is a circus performer who has a chance to defect, or leave the Soviet Union without permission, while his circus is performing in New York City in the mid-1980s. He soon finds that being poor in New York has more similarities to being poor in Moscow than he thought. Perseverance pays off for Williams as he learns a new language, a new lifestyle, and finds a place in society that he can call his own. The Cold War was still in full bloom when the Williams vehicle hit the theaters. Today's viewers will still enjoy the flick but may be puzzled over some of the references to the ongoing but muted conflict between the United States and the Soviet Union. The movie is an opportunity to watch Williams at the height of his zaniness and creativity. In the midst of the comedy, though, is the story of a man willing to walk away from everything he has known. Williams manages to bring that aspect fully to the screen. 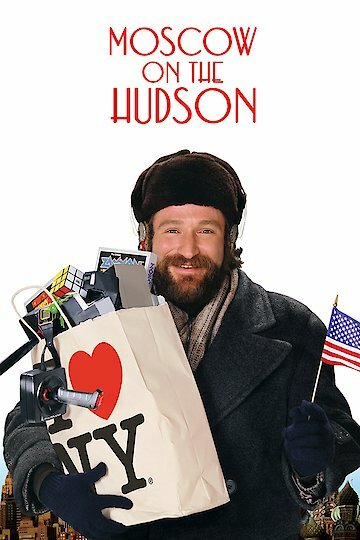 Moscow on the Hudson is currently available to watch and stream, buy on demand at Amazon, Vudu, Google Play, FandangoNow, iTunes, YouTube VOD online.